Brinjal, also known as Eggplant, is popular in Andhra region especially for the different varieties of chutneys and curries that are made with it. 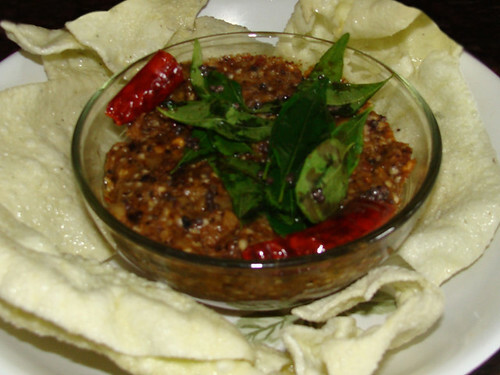 Here is the BRINJAL CHUTNEY RECIPE from the kitchen of Smt. Ganti Bhaskar. This is a delicacy from Andhra Pradesh, traditionally called Vankaya Muddha Pachchadi, and is a delicious accompaniment to steaming rice. This post is a tribute by her daughter Anjani Duddu. The whitish green brinjal always brings back memories for Anjani. Childhood memories of her parents & her village where this brinjal was a native vegetable. She grew up in Hyderabad where this brinjal was not easily available in her younger days. She remembers how it was a much sought after gift whenever any family member from the village visited them. Even though it is now available in the local grocery store in Hyderabad, for her, it will always be a special memory. Her mother, Smt. Ganti Bhaskari, prepared this excellent chutney with brinjal very often. She passed away in July this year at the age of 83. This post is a tribute in her memory and an attempt to document one of her recipes loved by the family. Smear brinjal with little oil all over and roast on flame until the skin becomes soft and can be easily peeled. Peel off the skin from brinjal and chop roughly. 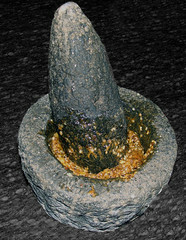 Grind along with green chillies, salt and tamarind on a grinding stone to a coarse pulp. (Grinding on a stone slab gives the perfect consistency which cannot be replicated if mixie or blender is used). Heat 1 tsp oil in a wok. Add the ingredients for tempering and when the mustard starts spluttering, take off flame & set aside. Grind to a coarse paste, preferably with a mortar and pestle. However, these days, most people prefer the convenience of a mixie. Add this paste to the brinjal pulp and mix well using mortar and pestle if necessary so that the ingredients are blended well. Garnish with mustard seeds, red chillies and curry leaves tempered in the remaining oil.